Well, they all sprouted, all the Purple Cherokees. The oldest seed is closest (2015). Those seedlings are very leggy. Not sure they'll survive. Stems won't be very strong. I have a reflective mylar sheet behind them to brighten things up. 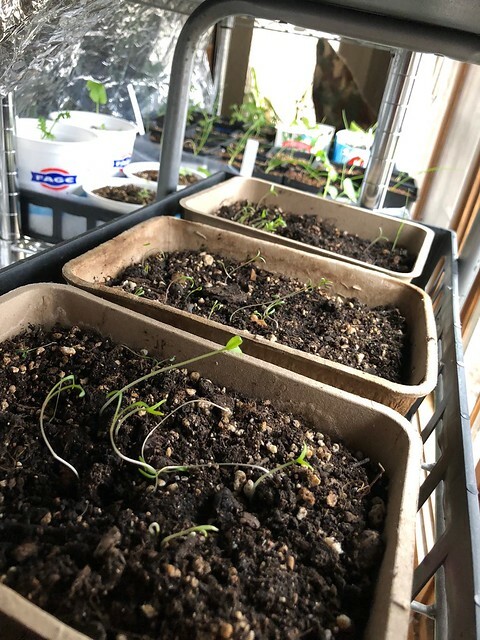 The middlebin has seed from 2016. They also are starting to get leggy, but not as bad. And last but not least, the 2017 seed sprouted. So they all had good germination rates. The pots they are in are GoMacro containers I got from Whole Foods. They can just get planted as is into the ground. It was a troubling news day. Another item has been added to the list of "This item is known to the state of California to be carcinogenic". This time a judge ruled that roasted coffee is a carcinogen. It has acrylamide, which the coffee industry and FDA have not really tested much. Since the burden of proof was on the industry to prove, and they only had one study, well, you will now see signs at Starbucks, Dunkin Donuts, and McDonalds telling you coffee is carcinogenic. Acrylamide is produced when roasting coffee beans at high temperatures. Potatoes will also produce this compound. It is great for making plastics. Not so good for animals but the quantity used in the study was ridiculous. Safe consumption amounts have never been determined. Acrylamide is also found in cigarettes. The need for additional study is there. People working in close quarters where the beans are roasted are most at risk. But telling you that coffee is no good, poppycock. I use the grounds in the garden. The chemical breaks down but the question remains for me, will coffee grounds still be allowed in certified organic gardening/farming? It makes a big difference if I decide to become an urban organic farmer. I hope they sort it out quickly. Although anything I grow will never be sold in the state of CA, so it may be moot. We'll have to wait and see what happens. 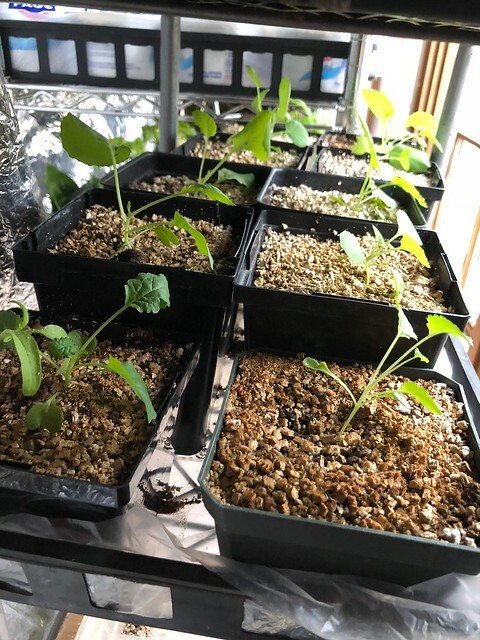 Meanwhile, the other seedlings are doing well. Collards and Lacinato (Dinosaur) Kale. Somewhere I also have Siberian Kale. Easter weekend, lows outside around 27° F. More on the outside garden later. For now, we covered it back up after yesterday's high of 65°. Three days of rain created a lot of mud and more potholes. Gotta go make the pancakes now. Some people are impatient.